Nyakio's Marula & Neroli Brightening Oil: Is a lightweight oil that targets imperfections, minimizing the appearance of discoloration and uneven skin tone. Marula and neroli oils, rich in antioxidant vitamin C, helps brighten and protect. Both oils are cold-pressed to preserve their nutrients. Marula and neroli oils have a rich history, being used by women from Morocco to Mozambique for their skin improving properties. Marula oil, "Africa's Miracle Oil," is derived from the marula tree which grows only in sub-equatorial Africa, making it a rare treasure. Beautifully fragrant neroli oil undergoes an extensive extraction process from the flowers of the bitter orange tree in Morocco. Nyakio's Maracuja & Yangu Soothing Oil: Soothe and nourish skin while calming red, sensitive areas with Nyakio's Maracuja & Yangu Soothing Oil. With their high content of essential fatty acids, maracuja and Yangu oils blend to create a gentle barrier for the skin. Both oils are cold-pressed to preserve their nutrients. 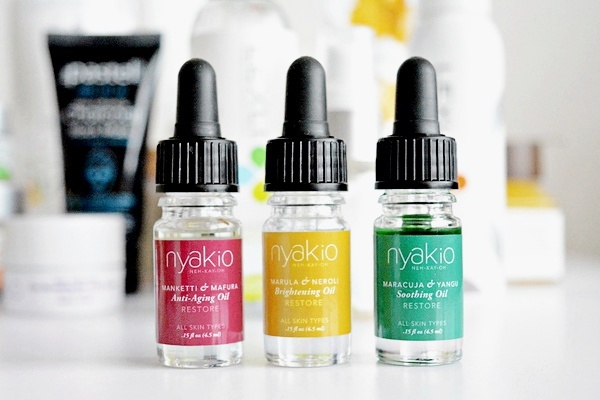 Nyakio's Maracuja & Yangu Soothing Oil Color-corrects the appearance of redness with a natural green tint to Conditions, soothe and calm skin. Yangu, sourced from the "Beautiful Tree" in South Africa, and Maracuja from Rwanda 100% Vegan Cruelty-Free.